You turn on your HVAC unit and find that your breaker trips. Usually it is because the unit is pulling more amps than the breaker is rated for. If your breaker is tripping the last thing you want to do is keep resetting it as this could potentially start a fire. It is important that you find the root of the problem. The reasons for the breaker tripping could be something as simple as a dirty air filter or dirty outside unit, an issue with the breaker itself or more complicated like a shorted motor or the compressor is failing. Your air filter is dirty: Running your HVAC unit with a dirty air filter is like holding your hand over your mouth and trying to breath. The same concept applies when your unit is starving for air due to a dirty air filter. Outside unit is dirty: Coils on your outdoor unit need to be kept free of debris and dirt. Coils will collect debris from normal use and chemically cleaning them on a regular basis will prevent restricted air flow causing your breaker to trip. It is important that you do not try to clean the coils yourself. Not only do you lack the proper chemicals, causing more harm than good, you could also damage the fins or coils. 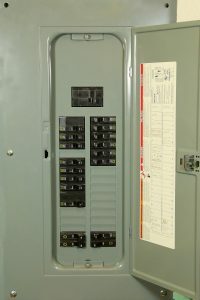 Issue with the circuit breaker: Loose wiring or loose connections can cause the breaker to trip. Burnt wiring, or poorly wired into the panel. The breaker itself is bad and needs to be replaced. All can be common causes for breaker(s) tripping. Compressor is failing: The compressor is called the “heart of your HVAC”. When it starts it pulls lots of electricity. When it begins to fail it could cause more amps to pull electricity thus causing your breaker to trip. A short fix is to have a “hard start” put on your compressor to help it start. Your compressor could also be “grounded” or “a short to ground” which means that an electrical winding inside the compressor has broken and hit the side of the compressor. This causes a direct short to ground, igniting the oil and causing a burnout. And, of course, the circuit breaker trips due to the sudden current surge. A Bad capacitor: A weak or failing capacitor could pull too much electricity and cause your breaker to trip. A simple capacitor replacement by a HVAC Technician can remedy this problem. The motor(s) are shorting: Your electric motors in your HVAC unit can run for hours, causing a lot of wear and tear. If a motor runs hot for too long the wire insulation can break down, leading to an electrical “short.” When a motor shorts, electricity bypasses its normal path. This shortcut, if you will; allows more electricity to flow than the wires can handle, causing the wires to overheat/ melt and cause a fire and/or trip your breaker. Your heating and air conditioning unit has many working components to make it run and the breaker tripping could be many various reasons. If you are experiencing this problem, call Performance Heating and Air Conditioning (916) 933-2683. We will be happy to schedule an appointment for one of our technicians to come to your home and offer you solutions and fix the problem. No repair too small or too big for us. We look forward to hearing from you.